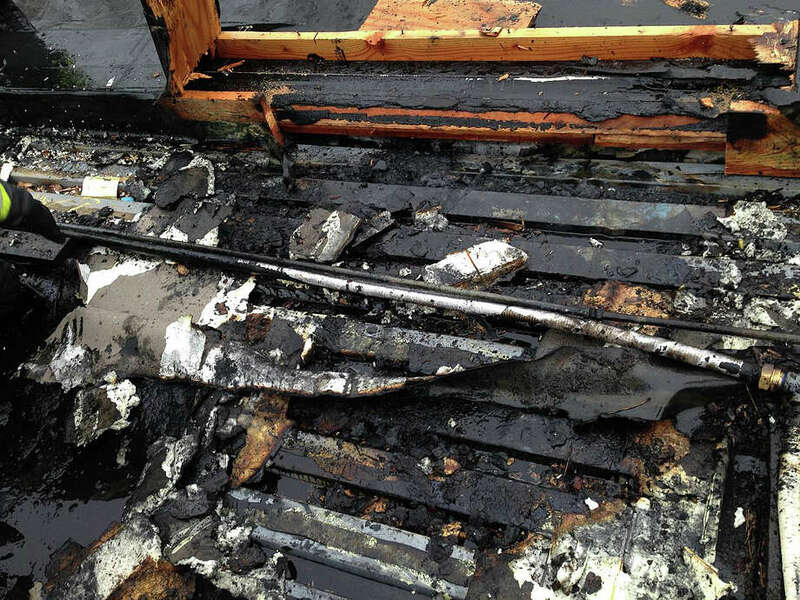 Fire damaged the roof of the Gym at Southport Athletic on Saturday, but the flames were extinguished before causing extensive damage. Fire erupted on the roof of a Southport gym Saturday morning while members worked out in the building. Flames were spotted by drivers on Interstate 95 coming from the roof of the Gym at Southport Athletic about 7:30 a.m.
About the same time, fire Lt. Lee Corbo, who just got off from working the previous night shift, also saw the fire at the Old Post Road gym and entered the building to help the manager evacuate occupants. When firefighters arrived on the scene, the building has been evacuated safely. There was a moderate smoke condition inside, but the fire continued burning on the roof. Engine 4 arrived on scene less than four minutes after the first reports were received by the dispatch center. Both ground and aerial ladders were used to gain access to the roof and a hose line was deployed. Firefighters on the roof found two gas line fires in the area of repair work performed earlier in the week. The flames were quickly brought under control before spreading to the rest of the building. Additional fire crews placed protective salvage covers inside the building to prevent rain water damage to interior wood floors. There were no reported injuries to firefighters or civilians at this incident. Representatives from the Fire Marshal's Office and Building Department were called to the scene to investigate the cause of the fire and check on the safety of the structure. "We were very lucky to receive early notification of this fire from alert commuters before interior smoke detectors were activated." Assistant Fire Chief Scott Bisson said in a statement issued after the fire. "The fire damaged the roof of the building along with gas and electric utilities requiring repair but most portions of the business are still able to operate at a limited capacity while these repairs are being performed." The scene was cleared by the last fire units by 10:30 a.m.